Decide. I posted the above quote on my Facebook earlier this week. It struck a chord with me. I’ve struggled with my weight and my unhealthy relationship with food for so long it became my comfort zone. My food behaviors started in childhood. I know that change was a long time coming and the turning point didn’t just happen in an instant, but it felt like it. One day I just got fed up and disgusted with the way things were and I decided. I decided to make the change that would allow me to move towards my goal and break the chains that have held me back from my purpose. At this point I can’t tell you what took me so long to get to this place. I am just glad that I did. Within an hour or so of posting this quote on Facebook I was helping out at a health fair for work. We had a table with diabetes information and some models of what 5 lbs of fat looks like compared with 5 lbs of muscle. That sparked some conversation with people. Some people would pick it up and talk about the fat they needed to lose. Others would pick it up and talk about their success story. One woman had lost 100 lbs. Another woman had lost about 20 lbs and spoke so confidently about how she intended to lose the rest. She talked about how she used to live and the changes that she had made in her eating and activity. I asked her, “What changed for you?” and she said, “I decided that I didn’t want to live this way any more.” She decided. The words echoed in my head. Could it really be that easy? 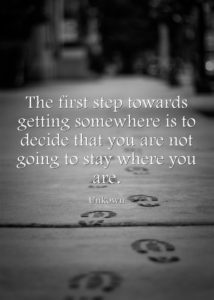 Are you ready to decide that you’re not going to stay where you are any longer? Once you decide it’s time to focus. Focus on actions that move you forward towards your goals. Focusing on the past does not move you forward. It’s OK to learn from the past but don’t hang out there. Focus on what you can control. What you focus on drives you. There is value in gaining knowledge but don’t get stuck acquiring enough knowledge until the time is perfect. The time will never be perfect. Take what you know and take a step forward. Build momentum. Continuing to build knowledge and applying that knowledge with action. Each day start out stating to yourself what your goals are and the steps you will take today to move towards them.